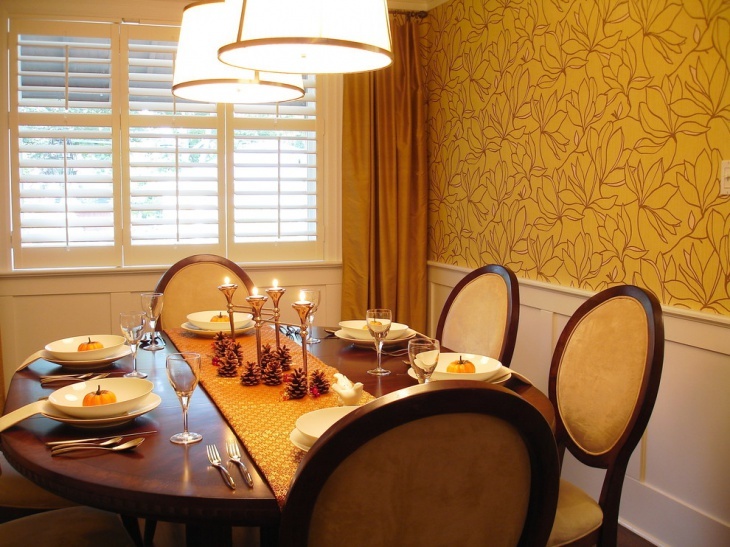 Dining rooms are generally the central part of the house where you enjoy having meals with your family and friends. 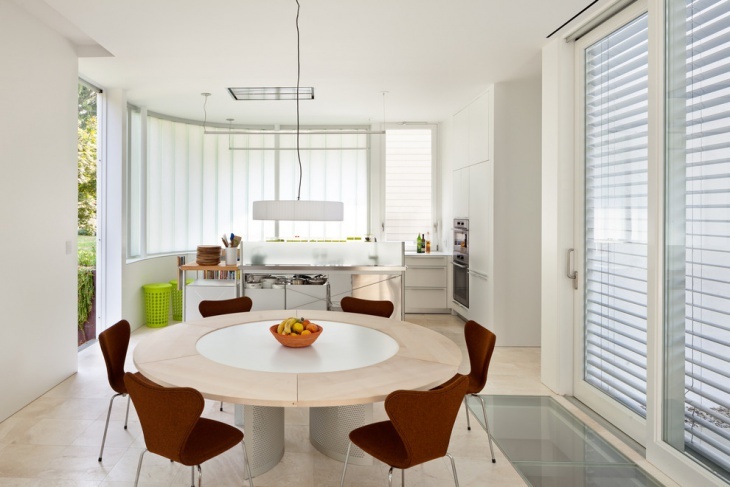 A spacious and comfortable dining table serves the purpose of occasional and everyday dining. It also makes the room look more settled and composed. Whether you have a small or a big dining space, round dining table designs are a must try as they give an elegant and pleasant appearance to your whole room. We have put together 10 best round dining table designs, to give you plenty of choices before you narrow it down to ‘the one’. 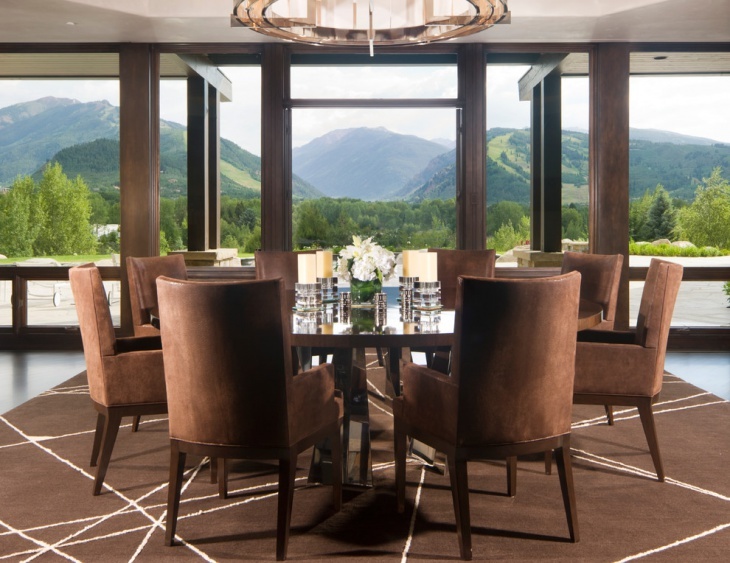 Dark chocolate colored wood is one of the ideal color choices to opt for your dining table. Round dark wood dining table helps to bring a refined elegance to your space. You can decorate the table top with some beautiful fresh flowers for bringing some colorful charm to the overall appearance. One of the elegant and simplistic round dining table design is a glass top table. Glass top offers you a lot of flexibility to decide on the color and pattern of the chairs. You can go for a simple white colored chair for giving a polished and uniform look to the entire setup. Another evergreen design to try is the large round dining table with comfortable cushioned seats in the bottom and back. If you are not planning to try new ideas to experiment with, then this design will be a safe and excellent option to try. A small dining table can be equally beautiful considering you pick the right piece for your home. 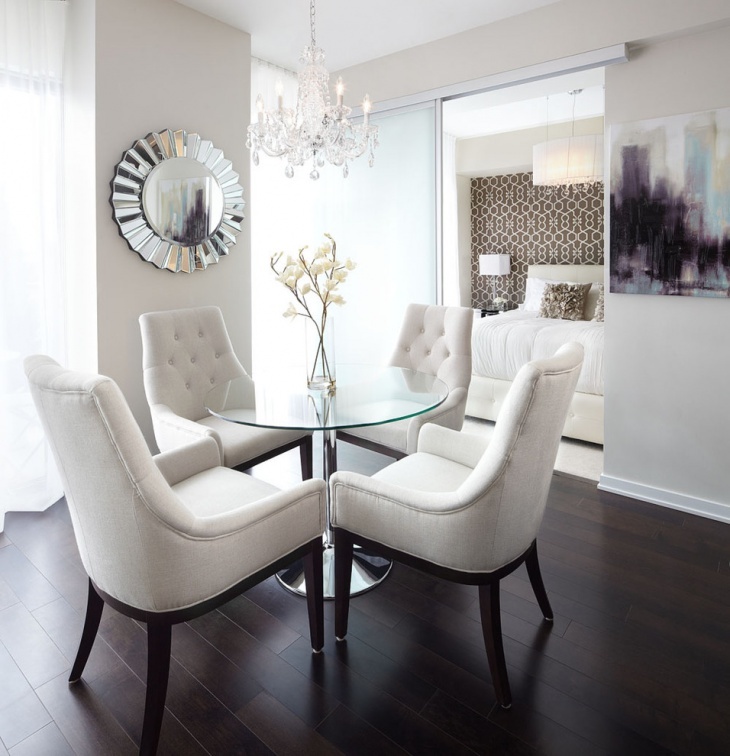 A white table with brown chairs is a sophisticated and appealing color combination that you can have in your home. Match the look with vibrant vase or flowers for giving a colorful glow to your space. 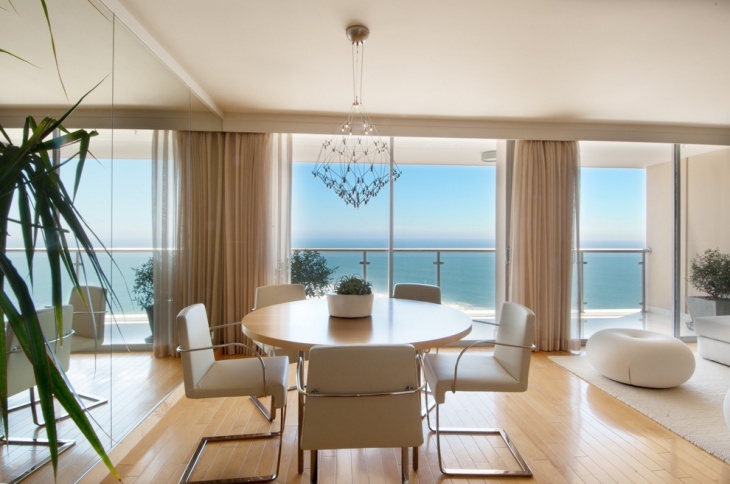 If you have bright interiors in your house, a complete white round dining table can be the best choice to make the look more subtle and balanced. 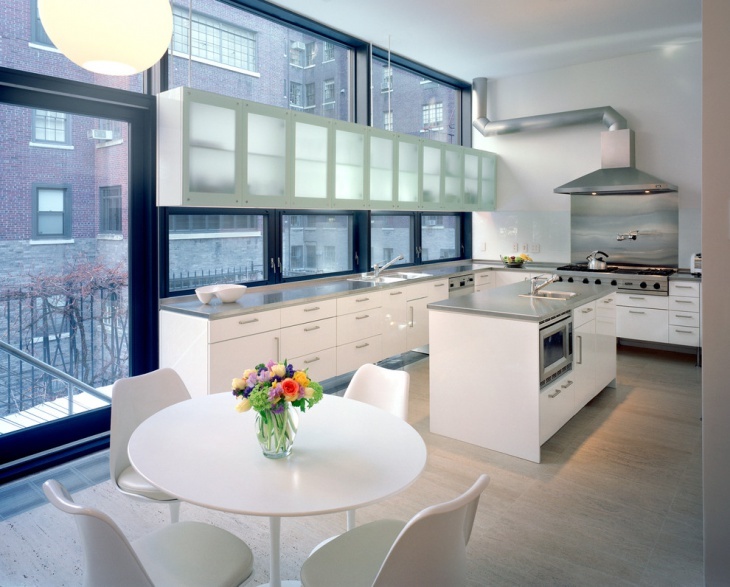 If maintained well, white pieces can be one of the most eye appealing elements of your home. For a royal look to your dining space, you can go for an oval shaped sleek wooden table in the tone of the natural wood. The look can be matched well with deep cream and soft brown chairs. Include a classic chandelier and a beautiful rug to make the look sober and charming. 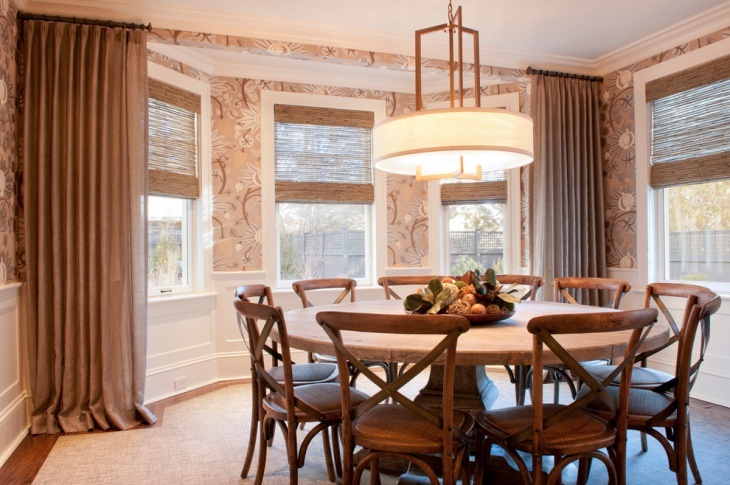 Small compact round dining tables can be matched well with high and tall dining chairs. The design is simple and goes well with almost all dining room decors. You can bring a personal touch to your space by adding a vase or any other accent piece. If you think the wooden look of dining room table is coming out to be flat, include a unique and colored piece of a chandelier to transform your space into interesting and original. 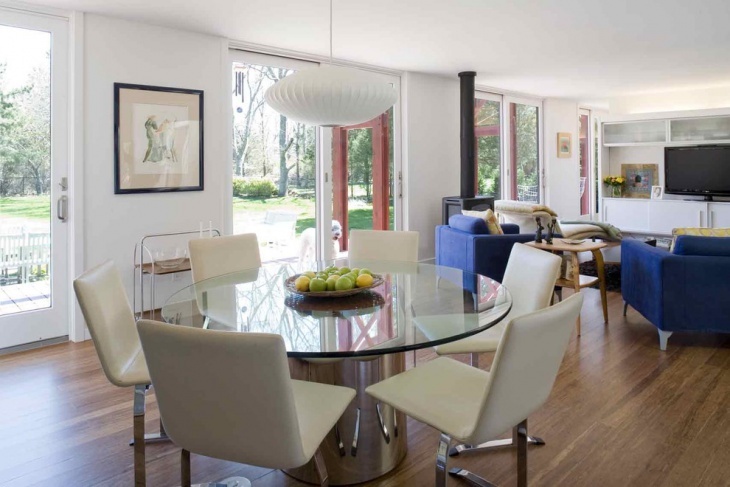 From traditional to modern, round dining room tables fit well in all the areas. The round-table designs are perfect to bring style and space to your dining area. Round tables can be adjusted well to the neutral or jazzy appearance of your home.